Created the thread to have sonewhere to post this! NASA's JC Liou of Orbital Debris Office: We expect our Space Debris Sensor to fly to ISS on Nov 1 @SpaceX's Falcon 9/Dragon. Edit: so I can't count! CRS-12 is NET August, CRS-13 Nov. The Space Debris Sensor (SDS) has completed functional testing and been delivered to the Kennedy Space Center for final integration checkout with the International Space Station (ISS). From there it will go into storage until a SpaceX launch vehicle is ready to deliver it to the ISS. Launch is currently scheduled for late 2017. The SDS is a flight demonstration of an impact sensor designed to detect and characterize impacts by small debris objects. The sensor will be attached to the ESA Columbus module facing the ISS velocity vector with one square meter of detection area. The sensor combines multiple technologies to measure the time, speed, direction, size, and density of objects greater than 50 µm in size. With this information, as well as the orbital position of each detection, the sensor should collect enough data over its intended minimum 2-year mission to update the NASA Orbital Debris Engineering Model for objects smaller than 1 mm near ISS altitudes. With lessons learned from the SDS experience, a follow-on mission to place a second-generation sensor at higher altitudes will someday provide the ability to update the risk from small debris to many operational spacecraft in low Earth orbit. Olaf found a reference saying ASIM is now planned to launch in 2018, so it appears the external payloads for CRS-13 will be SDS, MISSE-FF and TSIS. Sorry, I´ve modified my post. TSIS will be launched NET 2018. Hmmm, the project page at LASP still shows November. All packed up and ready to go. Here we come, Florida! TSIS-1 was originally intended for the NPOESS satellite program, with a $42 million contract given in 2009. Next it was targeted for the Polar Free Flyer satellite program, and finally ended up as an instrument to be mounted on the ISS. 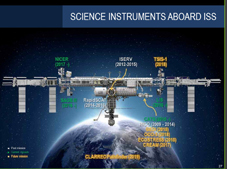 TSIS-1 has two instruments: the Total Irradiance Monitor (TIM) measures the total solar irradiance (TSI) that is incident at the outer boundaries of the atmosphere; and the Spectral Irradiance Monitor (SIM) measures solar spectral irradiance (SSI) from 200 nm to 2400 nm (96 percent of the TSI). TSIS-1 also has a precision pointing mechanism to aim the instruments. Also attached: Pdf presentation from Nov. 2015 giving an overview of TSIS-1. MISSE-FF will be mounted on the exterior of the ISS where it will hold materials samples to test their performance in space. It will allow individual sample carriers to be robotically swapped out. MISSE-FF is a commercial facility owned by Alpha Space that will host both goverment and private industry experiments. There was a recent FISO Teleconference on MISSE-FF on April 5, 2017. PDF and MP3 files are attached. What is the average timeframe from arriving at the Cape until launch? Or another question. Are three months enough from arrival to launch? Verifies that all people, parts and paper are ready for the shipment of the payload to the launch site and are ready to begin launch site activities. This is 3 months until launch. Delivery of the spacecraft is generally 30 days in advance of launch. The Falcon Users Guide is irrelevant for this. 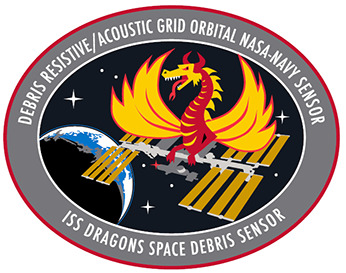 It's a NASA science payload on a Dragon flight. Why would this be facing the velocity vector? At first blush that would seem to be the direction of least debris flux. Stuff at 400 km but going slower than the ISS would have a lower perigee. That would take it into the denser atmosphere, where it's orbital lifetime would be less. AIUI, that's why the ISS is flown at the altitude it does, so that the residual exosphere scrubs small debris from orbit. Now a rearward facing surface would be exposed to debris with perigees at or below the ISS altitude but with higher apogees. These would have higher velocity than the ISS and "catch up to it." However, if one assumes that orbits circularize with greatest drag at perigee, small debris, with corresponding lower coefficients of drag, would act as if constantly being accelerated in the -V direction. That would have them impinge from the front. Does that mean that SDS expects minute debris to be in circularized orbits rather than elliptical? I was thinking the idea was sort of like bugs and windshields. Your front windshield gets covered in them. The rear glass not so much. If you wanted to place a sensor to detect characteristics of bug-windshield impacts you'd want it on the front of the vehicle. That idea might not translate to orbit, but that's what I thought of as I read it. I would think crossing orbits (polar, for instance) would be greatest debris impact risk (and the highest relative velocity). This chart by Mr. Zurbuchen also says 2018 for TSIS-1. So we have multiple recent references for TSIS-1 launching in both 2017 and 2018. One issue to consider is November 2017 is in Fiscal Year 2018, so you have to keep that in mind when interpreting some of the charts. Hopefully we'll find more definitive information about the schedule soon. Yes. An object in an intersecting polar orbit would approach at a quartering angle from the front, at over 10 km/s relative velocity. An object in a overtaking orbit (like a GTO at perigee) could approach from behind, but would have no more than ~3 km/s relative velocity.